And there’s only *one* to enjoy it. 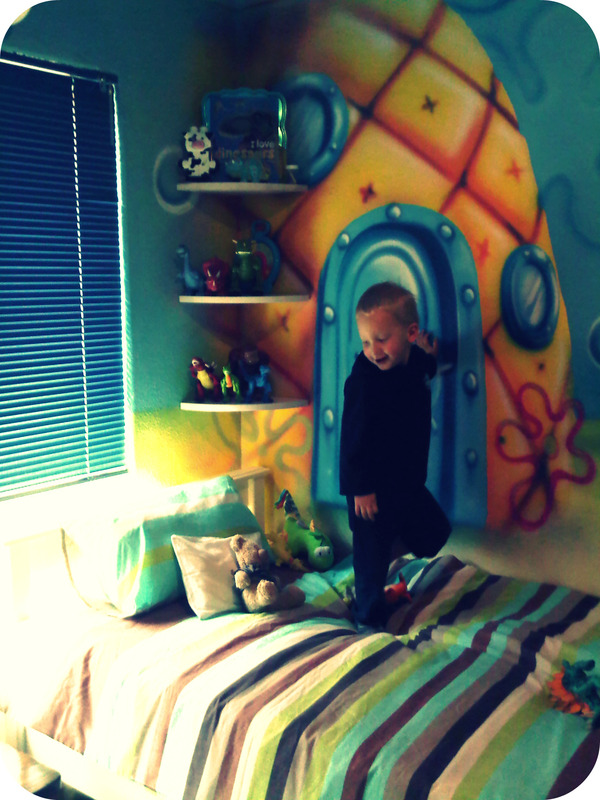 The Boyfriend and I have worked hard this weekend on The Kid’s bedroom makeover. 1. Paint over Spongebob mural. This involves first priming the wall with white paint and then painting colour over. It includes four walls and one ceiling. It involves removing 3 floating shelves and one aircon. We’re doing it tomorrow. 2. Paint colour onto the walls. Probably red and apple green. Or sky blue and yellow. Paint a white finish on the cornices and skirting boards. 3. Get the carpet steam cleaned and buy a soft rug to go next to his bed. 4. Have blinds fixed or replaced. Boyfriend decided to DIY fix them and it was a slight botch-up. 5. Buy canvasses and oil pants and make some dinosaur art to go on the walls. Paint a chalkboard square behind the door, so The Kid can draw on the wall. 6. Buy a bedside table and nightlight. 1. Bed bought and spray painted off -white. 2. Bed assembled and cot removed from room. Involved much clever engineering and thinking out the box, but we managed. 3. Bought/found/bid on linen for The Kid’s new bed – he now has a dinosaur print set, a planes, trains and trucks set and a plain colourful stripey set. Still waiting for the dino one to arrive. The planes/trains one I bought from Ackermans and the stripy one I found in my cupboard. I was a leftover from the decor from Big Brother Africa house that somehow found its way into my possession a year ago. 5. Repacked his cupboard so that I use the limited space smarter. Sorted out toys into different plastic containers. These containers are on wheels and slide under the bed. 6. Moved his chest of drawers out into the house, under the wooden staircase. This chest contains most of his toys that usually land up distributed around the house. Makes it easier to pick them up and pack away and also utilises a space that was previously wasted. 7. Instal more shelving so I can pack his books on it and store more of his toys/toy boxes. So…once I’m all done, you know I’ll be posting pictures…I actually have a few right now, but can’t share them because the whole internetz seem to be borked and I can’t even get onto it…so I’m blogging from my BlackBerry. Whaddya think of the sneak preview picture, though? This entry was posted in family things, life things, love things, parenting things and tagged DIY dilemmas, grown-up shiz, home decor, home improvement, mommy things, The Boyfriend, The Kid. Bookmark the permalink. So cool! How was his first night??? .-= Gina´s last blog ..My very first blog award 🙂 =-. .-= NickiD´s last blog ..Wordless Wednesday =-. .-= Alet´s last blog ..You know your child chooses your boyfriend over you … and other things: =-. Looks great – sounds wonderful. .-= JessicaGiggles´s last blog ..Beautiful Blogger Award =-. Wow, you were busy! Looks like it’s going to be a dream room! .-= Jenty´s last blog ..Can’t handle the smell =-. Now I’m exhausted. Impressive stuff. .-= kyknoord´s last blog ..Credo quia absurdum =-. I like the stripes, and he looks seriously stoked with his big boy bed! Awesome, want to come across the pond and do my whole house. .-= Bobbi Janay´s last blog ..Sneak Peak =-.